Nikolai Woldemar (or Nikolai Gustavovich, as he was known in Russia) Schilder came from a small German noble family originally from the Baltic. In the 19th and early 20th centuries the Schilders gave Russia many well-known figures, including two artists, both Academicians: Nikolai Schilder and his son Andrei (a landscape painter and graphic artist). Nikolai Woldemar Schilder was born in Kharkov on 24 March 1828, or 12 March according to the old calendar He was the third son of Otto Gustav (Evstafy Andreevich) Schilder, a retired Cornet and Supervisor of the Moscow Commercial School. In 1845 and 1846, Nikolai made attempts to enter the School of Drawing of the St. Petersburg Society for the Encouragement of Artists, yet he was not accepted. In 1850 he enrolled at the St. Petersburg Academy of Arts, where he would remain a student for over a decade. In the autumn of 1850, Bogdan Willewalde, the renowned Professor of battle painting, requested the Academy Board to pay his pupil Nikolai Schilder a grant. Thus, Schilder received a grant at the Academy until 1858. In 1853, for his painting "In the Vanguard: The Lithuanian Regiment Leib Guard Detachment”, Schilder received his first award at the Academy of Arts - a small silver medal. Among the few military paintings created by the artist in 1854 and 1855 are several scenes from the Crimean War of 1853-1856. For the Academy exhibition of 1854, Schilder presented his "Scene from the Bashkadykliar Affair of 1853”, literally illustrating fresh news from the front. In 1855, he submitted "The Irregulars' Farewell” (1855, Russian Museum) for the Academy of Arts exhibition. Battle scenes appeared not to satisfy Schilder, however Doubtless influenced by the outstanding Russian artist Pavel Fedotov, whose follower the young painter had become, in the second part of 1850s he turned to genre art, also known as the painting of scenes from folk life. Dealing with a theme common in world art - the battle of innocence and corruption - "Temptation” was Schilder's first genre painting. In his biographical essay on Schilder, the art historian Alexei Savinov noted the marked resemblance between "Temptation” and Fedotov's watercolour "The Mousetrap, or Beauty Shall Be the Death of the Poor Maiden”. Describing similarities in composition and detail, Savinov comments on the allegorical use of the mousetrap by both artists. 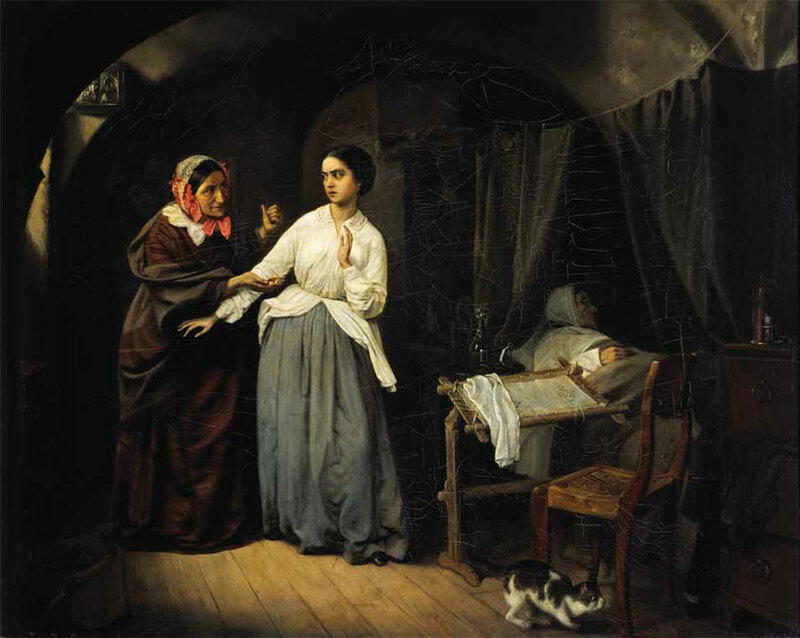 The cat hunting a mouse in Schilder's painting echoes the seduction of the poor girl by a cunning procuress. 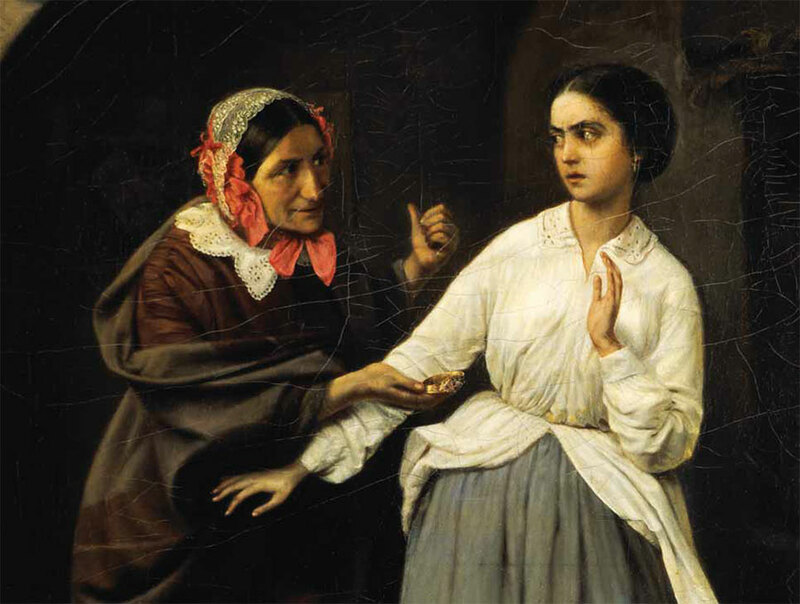 Schilder's "Temptation” already shows a number of traits typical of mid-19th century Russian painting. The light is skilfully distributed, lending the figures a sculpted air. The contrast between the muted tones and occasional bright patches of colour serves to heighten the dramatic impact of the painting. The nature of the characters is immediately apparent, the gestures and pose of each speaking volumes. The artist pays particular attention to a detailed portrayal of the objects surrounding the figures. In March 1857, Schilder submitted "Temptation” to the Board of the Academy of Arts and was awarded a large silver medal for his "successes in genre painting”. "Temptation”, however, is not on the list of works shown in the 1857 Academy exhibition. Not included on the list by mistake, or indeed not shown at the exhibition - who knows? This is but one of many mysterious circumstances surrounding Schilder's "Temptation”. In the winter of 1858, the canvas was shown at the annual exhibition of students' work at the Moscow School of Painting and Sculpture: pupils of the Academy of Arts occasionally submitted their works for these exhibitions in the hope of attracting the interest of Moscow collectors. 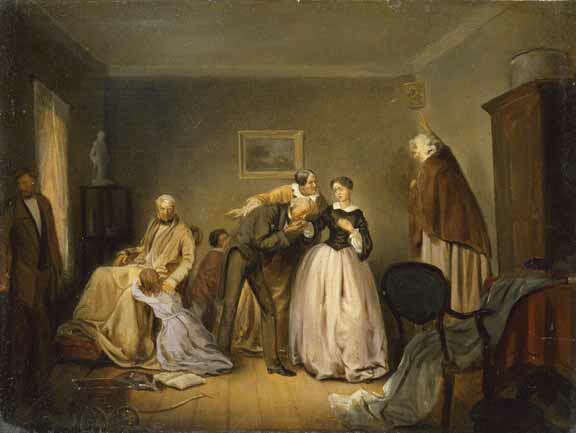 Schilder's next painting, "Family Happiness” (created in 1858, but sadly, did not survive), was shown first at the Academy of Arts exhibition, and, subsequently, at the students' exhibition in the Moscow School of Painting and Sculpture in 1859. In 1859 and I860, Schilder attempted to win a gold medal at the Academy of Arts. Studies for both works - "The Usurer” and "The Betrothal” - have survived and can be found in the Russian Museum. In 1861, the 33-year-old artist received the title of Academician for his portrayal of "battle scenes and scenes from folk life”. The title was granted as a result of Schilder's "Paying a Creditor” being shown at the Academy of Arts exhibition. Between 1853 and 1873, Schilder constantly took part in Academy exhibitions. From 1863 until 1879 he was a member of the St. Petersburg Artists' Assembly, a large association which included many of the capital's most famous painters. In the 1870s, however, he virtually ceased to take part in artistic life in Russia. Having begun his career as a painter of battle scenes and genre artist, Schilder largely devoted the second half of his life to portraiture. The National Art Museum of the Sakha Republic in Yakutia contains his portrait of General Mikhail Muraviev, created around 1864. 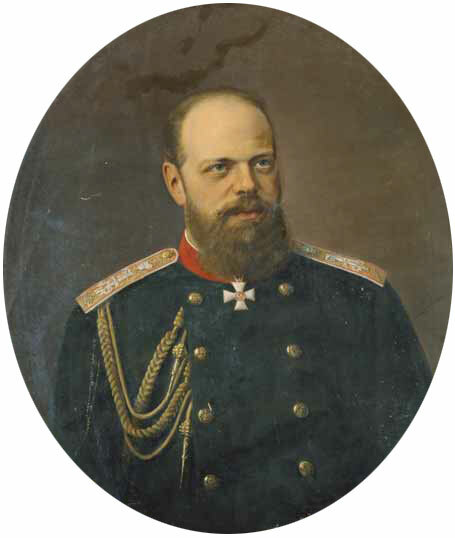 Portraits by Nikolai Schilder can also be found in the St. Petersburg Artillery Museum. For the Academy exhibition of 1873, the artist submitted his portrait of Major-General Petukhov and pastel children's portraits. From the 1860s, he was occasionally commissioned to paint portraits of the Tsar's family. We are familiar with his royal portraits from the 1880s and early 189 0s: the portrait of Alexander III (now in the Russian Museum) and pair of oval portraits of Alexander III and Empress Maria Fedorovna (now in the Musee d'Orsay, Paris). 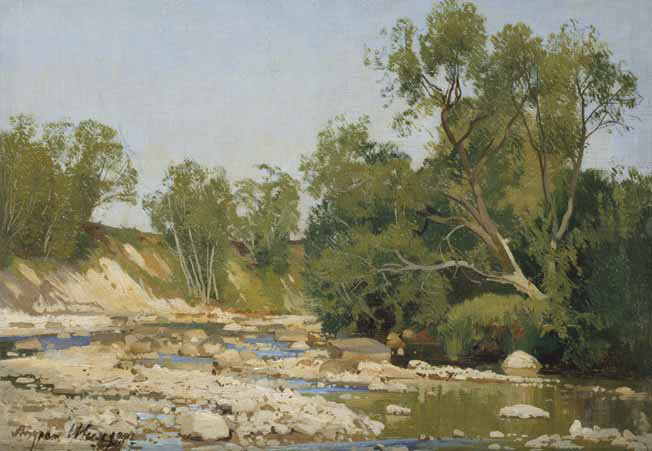 Nikolai Schilder is also known for his hunting scenes, paintings of horses and dogs and landscape studies. This broad range of genres was typical among students of the military painting class at the St. Petersburg Academy of Arts in the mid-19th century. Furthermore, Schilder, it seems, spent a large portion of his life making copies of famous painting on commission. 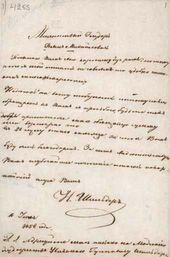 Documents from the Manuscripts Department of the Hermitage Museum show that in the 1860s-1880s, he frequently applied for permission to copy works from the Winter Palace. We know that the artist produced copies of the portrait of General Sievers from the War Gallery, the portrait of Catherine II by Johann Baptist Lampi the Elder, a portrait of Alexander Suvorov and the "Interior of the Choir in the Capuchin Church on the Pizza Barberini in Rome” by the French painter Frangois Marius Granet. This area of Schilder's activity was, most probably, driven by the need to support his family. The artist also painted a number of icons and, in 1862-1863, created the iconostasis of a church in the Danilovsky district of the Yaroslavl province. Schilder spent the final years of his life in Tsarskoye Selo near St. Petersburg, where he died on 13 (25) March 1898, the day after his seventieth birthday. Today, Nikolai Schilder is primarily known as the creator of "Temptation” which, until recently, was considered one of the first two Russian paintings purchased by Pavel Tretyakov in 1856. Preparations for the publication, in 2006, of an academic catalogue of paintings in the Tretyakov Gallery demanded that this information be confirmed. The first Russian painting purchased by Tretyakov was, in fact, Vasily Khudyakov's "Armed Clash with Finnish Smugglers”. Completed in 1853, this was sold to the collector in 1856, as a receipt from Khudyakov shows. The date of this receipt - 10 (22) May 1856 - became known as the date of the Tretyakov Gallery's foundation. The story behind Tretyakov's purchase of "Temptation” proved harder to establish. Whilst the bottom left hand corner of the painting clearly bears the artist's signature (scratched into the paint, as was Schilder's wont), the date is lacking, and this fact became the first in a whole train of complex and confusing circumstances surrounding the work. The above letter is documentary evidence that Schilder's painting was dispatched to Pavel Tretyakov, and the payment received, in 1858. The amount paid by the collector can be gathered from the following document: "Received from Pavel Mikhailovich Tretyakov, fifty roubles in silver, for the painting 'Temptation', sold to him for 150 roubles in silver. N. Schilder.” Undated and carelessly scribbled in pencil on a scrap of paper, for many years this receipt was considered to belong to Schilder himself. 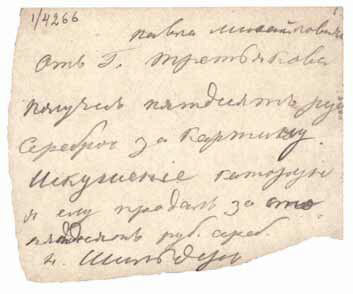 The marked contrast between this hasty scrawl and the elegant, neat handwriting in Schilder's letter, however, prompted the staff of the Tretyakov Gallery Manuscripts Department to submit the receipt for examination to handwriting experts at the Ministry of Internal Affairs Criminal Expert Centre. Having compared the handwriting in the receipt with examples of Schilder's and Pavel Tretyakov's hand, the experts concluded that the receipt had been written by an unknown party, presumably as an example. Thus, one of the mysteries surrounding "Temptation” was finally clarified. It was not until 1893 that "Temptation” was definitely listed as belonging to the Tretyakov Gallery collection. That year, Pavel Tretyakov published his first gallery catalogue: the "List of Works of Art in Pavel and Sergei Tretyakov's City Gallery”. From then on, the catalogue was updated and published every year. Around that time the art critic Vladimir Stasov, who was preparing an article on the gallery, consulted Pavel Tretyakov on the dating of "Temptation”. 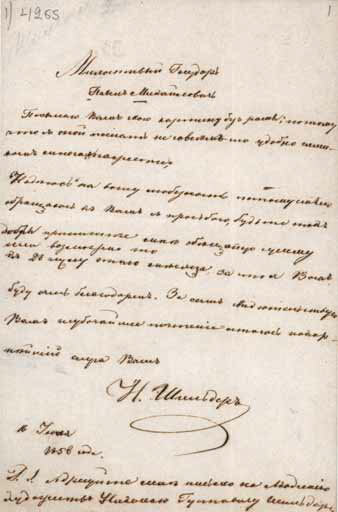 Having received a copy of Tretyakov's "List”, which had been prepared for publication, in August 1893 Stasov wrote to Tretyakov with a series of questions. One of these ran as follows: "Was not Schilder's 'Temptation'... painted in 1858? I have asked Schilder himself, but he cannot remember for certain.” Interesting to note that Stasov had already addressed his query to the artist - and the latter's response! Several days later, Tretyakov sent the critic a reply. 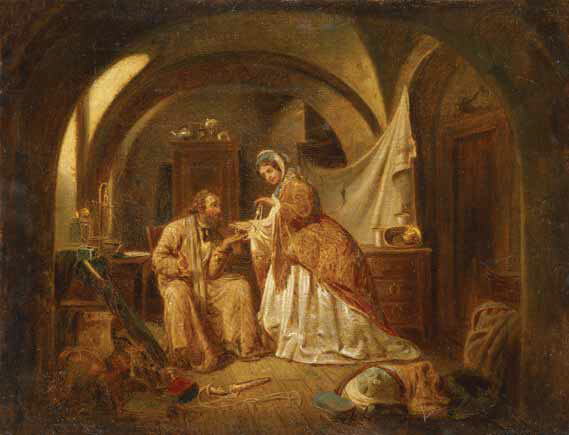 "Schilder's "Temptation” most likely belongs to 1856, as it was the first Russian painting which I purchased (in 1856),” he wrote, assuming that the work was created the same year it was sold and evidently forgetting Schilder's letter of 1858. In one of his subsequent letters to Stasov, Tretyakov, indeed, wrote: "I decided to collect Russian paintings and started in 1857.” Thus, within the space of a month, the year Tretyakov's activity as a collector had started had "changed” from 1856 to 1857. In his article on the Tretyakov Gallery, Vladimir Stasov dates the history of the gallery back to "early 1857”. Despite this reasonably assured conjecture, in the following gallery "List” of 1894, Tretyakov did not assign a date to "Temptation”. On 10 April 1894, Stasov wrote to the collector: "It would be highly advisable to list at least the majority, if not all, of the paintings with the year they were created, where the year is well known - even if it is not marked on the painting itself. For instance: p. 35. Schilder, 'Temptation' - 1856...” Following Stasov's recommendation, finally, in 1895, "Temptation” was listed in the gallery catalogue together with the date of its creation - 1856. This date, we feel, corresponds neither to the year "Temptation” was painted, nor to the year it was acquired by Tretyakov. 35 years after the event, as we have seen, the collector informed Stasov that he had purchased "Temptation” in 1856 - yet not only is there no proof of this, but the artist's letter to Tretyakov, dated 1858, actively contradicts this version. Thus, Botkina assumes that her father commissioned the work after seeing a preliminary study. Although she gives little evidence to support her theory, this version of events, with various minor differences, was adopted by all subsequent researchers commenting on the sale of "Temptation”. The commentary to the edition containing Schilder's receipt to Pavel Tretyakov suggests that "after selling his painting 'Temptation' to Tretyakov, Schilder made the final touches to the painting, dispatching it to its owner in July 1858.” It is difficult to imagine what "final touches” Schilder may have spent two years working on. Tests conducted by Lydia Gladkova in 2006 showed no significant added details on the canvas. To assess the likelihood of Tretyakov's commissioning "Temptation” from Schilder, let us recall the young collector's visit to St. Petersburg in 1856. Having met a number of artists, Tretyakov made several commissions and purchased Vasily Khudyakov's "Armed Clash with Finnish Smugglers”. All this was reflected in the collector's correspondence. Schilder's name, however, is nowhere to be found. In fact, there is no mention of Schilder in Tretyakov's letters before or after 1858: their entire relationship seems to consist of the artist's single letter to Tretyakov. Furthermore, the formal tone of this letter renders a two-year acquaintance at the time of its writing somewhat unlikely. Although "Temptation” was indeed purchased by Tretyakov in the early stages of his work as a collector, it was not, as was previously thought, one of the first two paintings bought. Between 1856 and 1858, the collector acquired and commissioned quite a number of works by Russian artists. These were all painters of some standing, Academicians or graduates of the Academy of Arts holding major gold medals. There were no pupils among their number - albeit young, all were already formed as artists. Their paintings had been approved by the Academy of Arts: Alexei Savrasov's "View in the Environs of Oranienbaum”, for instance, which Tretyakov purchased in 1858, was the landscape which brought the artist the title of Academician. In 1856 Nikolai Schilder, on the other hand, was still an average student at the Academy of Arts, with but a small silver medal to his name. Tretyakov may, of course, have noticed his battle scenes at Academy exhibitions in 1853-1855, yet in 1856 Schilder had not yet become known as a genre painter. "Temptation” is a work typical of an Academy student half-way through his education, and deserves precisely the award it received: a major silver medal. Unlikely that Tretyakov would have shown much interest in this somewhat raw genre painter, or commissioned a work from him specially. The first mention of Schilder's "Temptation” pertains to March 1857, when the painting was submitted to the Academy Board. Thus, the assumption that Pavel Tretyakov commissioned the painting in 1856 appears not to hold water. It is highly unlikely that the collector would have made a struggling young artist wait two years for 150 rubles - a sum which, for Tretyakov, was not a large one. It is equally improbable that, under such circumstances, the painter would have taken it upon himself to exhibit the work commissioned. We have already mentioned that Schilder's "Temptation” (albeit under the title of "Seduction”) was shown at an exhibition of students' work held at the Moscow School of Painting and Sculpture between 12 January and 8 February 1858. The exhibit (number 45) was marked with the name Schildern. In the catalogue of works shown, paintings already belonging to collectors appeared alongside the collector's name. "Seduction”, however, was not listed as belonging to a collector: Tretyakov's name does not appear on the list at all. The remaining paintings were marked as being for sale, yet our picture did not possess this comment. Most likely, this meant simply that it belonged to its creator. After the exhibition, the painting returned to Schilder in St. Petersburg. The most reasonable assumption is that the sale of "Temptation” was directly connected with this exhibition. It seems highly probable that Pavel Tretyakov saw the canvas at the Moscow School of Painting and Sculpture in the winter of 1858 and subsequently contacted Schilder with a view to purchasing it. In the summer of that year, Schilder wrote to the collector and sent him the work. This version of events agrees with all the information we possess on "Temptation”. Inspired by this success, the following year Schilder submitted his "Family Happiness” to be shown at the Moscow School of Painting and Sculpture, hoping to make another sale. It can reasonably be supposed that "Temptation” was likewise purchased by Tretyakov with a view to re-sale, yet was never re-sold. This brings us to yet another mystery connected with the painting: Schilder's canvas, it seems, spent some time housed outside Tretyakov's collection. On 24 June 1863, the artist Nikolai Nevrev wrote to the collector, pressing him to reclaim Schilder's painting, which was "still sitting” at his brother-in-law's house. Nevrev's brother-in-law was, we presume, a certain Sergei Golikov. Little is known of Golikov, and we cannot say why Schilder's "Temptation” "sat” in his house until 1863. In 1860, however, Sergei Golikov became an amateur member of the Moscow Art Lovers' Society, of which Pavel Tretyakov was also a member. Furthermore, the catalogues from the student exhibitions held at the Moscow School of Painting and Sculpture in 1859 and 1860 mention two copies of Schilder's "Temptation” painted by students and submitted for the lottery. How was it that pupils at the school were able to make copies of the painting? Was "Temptation” housed at the school for some time? Maybe in time experts will find answers to these questions. Why, finally, did Pavel Tretyakov comment on "Temptation” as being one of the first items he purchased? The key is, perhaps, that a large number of the canvases Tretyakov acquired between 1856 and 1860 were quickly re-sold, yet Schilder's work, along with paintings by Khudyakov, Savrasov and Lagorio, was one of the few which remained. When, in 1893, Tretyakov was compiling the catalogue for his gallery, he rediscovered "Temptation”, listing it as one of his very first purchases. The previous version of events, accepted for decades and stemming from the collector himself, was not easy to discard. The compilation of an academic catalogue, however, demands exceptional precision in dates. Schilder's "Temptation” was discussed by the Tretyakov Gallery's Attribution Council, which was to make a final decision. Naturally, the date of the painting's creation and the date of its sale were interlinked. In order to make its decision, the council re-examined all the information concerning the painting of "Temptation” and its appearance in the gallery collection. The Tretyakov Gallery academic catalogue now states that "Temptation” was painted in 1857 - the year Schilder received a large silver medal. Tretyakov's purchase of the painting is now marked as having been made in 1858 - the year Schilder wrote to the collector. Previously thought to have been written by Schilder, the receipt from the Tretyakov Gallery Manuscripts Department, albeit connected with the history of his painting, is now considered to have been written by an unknown person. Yet this is not all. Another riddle posed by our enigmatic painting is the existence of a second "Temptation” by Schilder, housed in the Serpukhov Art Museum. Thought to be a repetition created by the artist, this painting came to Serpukhov in the 1920s from the State Museum Fund. To this day, the previous owner's name remains unknown. The second "Temptation” is identical to the first in size, composition and detail, yet lacks the painter's signature. There is little doubt that it belongs to Schilder, however, and the two works were, most probably, produced around the same time. Will we ever establish for whom the artist produced the second version? And was it indeed a later one - or was it painted first? This question might well be raised by experts in the future. Turning to the oeuvre of lesser-known artists, we frequently encounter fascinating details from their life and work, and if the facts are elusive, concealed by time and difficult to establish, they nonetheless serve to broaden and enrich the known history of Russian art. The Schilder noble family appears in an issue of the "Dvoriansky Kalendar" (Noble Families' Calendar) (St. Petersburg, 1897. Vol. 2, pp. 92-106). Information concerning Schilder's years as a student can be found in documents from the Russian State Historical Archive (archive 789, list 2, items 18 and 22; list 19, items 724, 743 and 751; list 39, item 123). P.N. Petrov, "Sbornik materialov dlia istorii Imperatorskoi Sankt-Peterburgskoi Akademii khudozhestv za 100 let ee sushchestvovaniya" (Collected Material on the History of the St. Petersburg Imperial Academy of Arts, Covering the Hundred Years of Its Existence). St. Petersburg, 1866. Vol. 3, pp. 244-245. State Hermitage Manuscripts Department, archive I, list V, item 5 (1867), 11 (1885), 18 (1886) and 1 (1889). "Gosudarstvennaya Tretyakovskaya Galereya. Ocherki istorii. 1856-1917" (Essays on the History of the State Tretyakov Gallery, 1856-1917). Leningrad, 1981, p. 302. State Tretyakov Gallery Manuscripts Department, archive 1, P.M. Tretyakov, item 4727. State Tretyakov Gallery Manuscripts Department, archive 1, P.M. Tretyakov, item 4265, sheet 1. State Tretyakov Gallery Manuscripts Department, archive 1, P.M. Tretyakov, item 4266, sheet 1. The letter and receipt were published in "Pisma khudozhnikov P.M. Tretyakovu. 1856-1869" (Artists' Letters to Pavel Tretyakov, 1856-1869). Moscow, 1960, p. 47. From Pavel Tretyakov's correspondence with Vladimir Stasov. Moscow, Leningrad, 1949, p. 185 (letter dated 24 August). Ibid, p. 166 (letter dated 27 August). Ibid, p. 170 (letter dated 14 September). V.V. Stasov, "P.M. Tretyakov i ego kartinnaya galereya" (Pavel Tretyakov and His Picture Gallery). Russkaya Starina, 1893. December, pp. 569-608). From Pavel Tretyakov's correspondence with Vladimir Stasov, p. 182. A.P. Botkina, "Pavel Mikhailovich Tretyakov v zhizni i iskusstve" (Pavel Tretyakov in Life and in Art). Moscow, 1951, p. 37. "Pisma khudozhnikov P.M.Tretyakovu. 1856-1869" (Artists' Letters to Pavel Tretyakov, 1856-1869), p. 289. State Tretyakov Gallery Manuscripts Department, archive 10, item 1005, sheet 2. Russian State Archive for Literature and Art, archive 680, list 1, item 169, sheet 5. "Pisma khudozhnikov PM.Tretyakovu. 1856-1869" (Artists' Letters to Pavel Tretyakov, 1856-1869), p. 292. "Pisma khudozhnikov PM.Tretyakovu. 1856-1869" (Artists' Letters to Pavel Tretyakov, 1856-1869), p. 141.